MAME stands for Multiple Arcade Machine Emulator. When used in conjunction with a game's data files (ROMs), MAME will more or less faithfully reproduce that game on a PC. MAME can currently emulate over 1500 classic arcade video games from the '70s and '80s. The ROM images that MAME utilizes are "dumped" from arcade games' original circuit-board ROM chips. MAME becomes the "hardware" for the games, taking the place of their original CPUs and support chips. Therefore, these games are NOT simulations, but the actual, original games that appeared in arcades. MAME's purpose is to preserve these early decades of video-game history. As gaming technology continues to rush forward, MAME prevents these important "vintage" games from being lost and forgotten. For more information visit the official MAME web site. 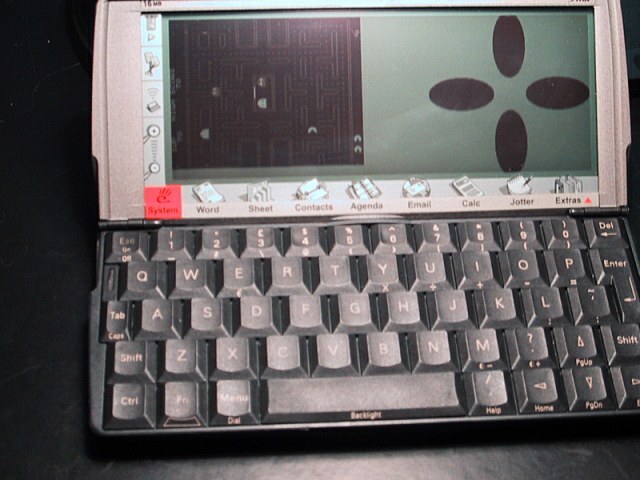 EMame is the port of MAME to EPOC32 and can be used on Psion devices such as the Series 5mx and Series 7. Latest version of EMame is 1.2, see the readme on the new features and how to install. Latest sources are released under the GNU General Public License. Read the building instructions to see what else you need to compile and link EMame. I'd strongly suggest to read the instruction first to see what you're letting yourself into. I've includes all of the generated .wins, .marm and .dsp files - if things don't work according to the instructions, use them instead. Please bear with me if I don't respond straight away on your "it doesn't build" email. This version of Emame supports 592 games see the game list. I've also written an EMame FAQ, which you may find useful. 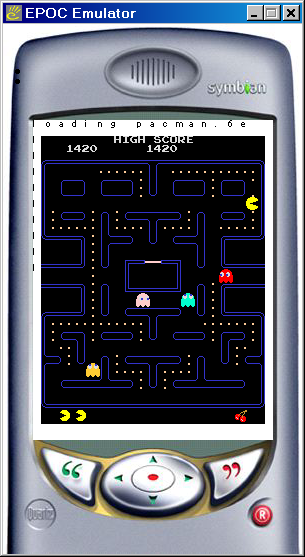 Here' my old time favorite Pacman; it's running on the Series 5mx. 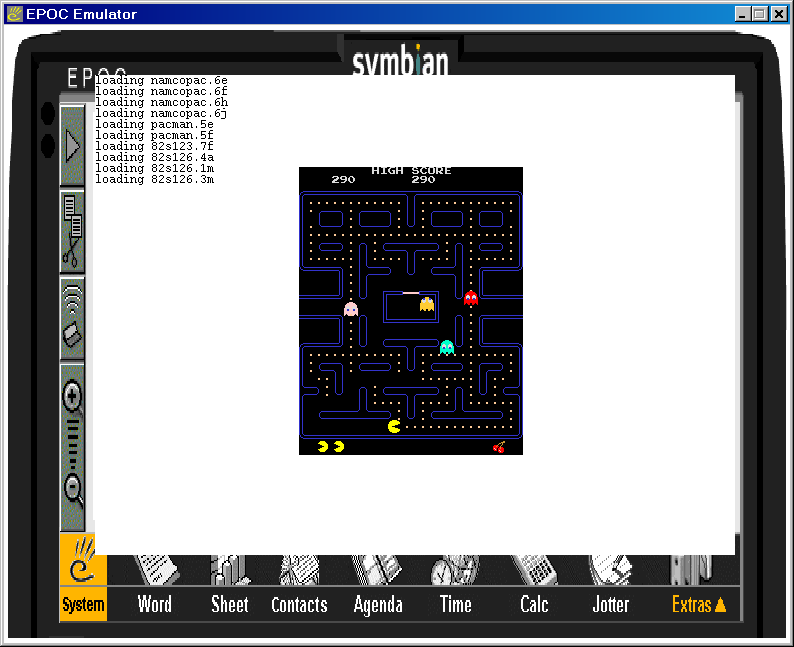 Here's pacman again, this time running on the ER5 emulator (Series 7 configuration). No one is allowed to distribute ROM images with MAME, so EMame doesn't either. Rumors have it that www.mame.dk might have a 'few' rom files :-). Here's the romlist for the current version of EMame. Remember to copy these zip files in either c:\emame\roms or d:\emame\roms. I've written a paper on EMame for Symbian's developer network. That website is no longer up and running but I do still have my original version (non Symbian developer netwerk branded).